The Victorians started well and got a length lead early in the race. This margin increased to a 10.94 second margin at the finish. The only interest was in the minor placings. The end margins do not reflect the great tussell between Terrell of SA who won, Reedy of Victoria and Powell of Queensland. The three scullers had a great race with Terrell leading for the first half of the race, Reedy taking the lead in the third 500 metres before surrendering it to Terrell who had a great last 500 metres. This was a tightly fought race between Victoria and New South Wales although Victoria maintained the lead throughout the race. NSW finished strongly but the Victorians held on to win. Interstate Youth Eights launch for race. This was one of the best races of the day with New South Wales, Victoria and South Australia fighting all the way with margins of 0.10 seconds between first and second and 0.53 seconds between second and third. It was great victory to the NSW crew. The top three crews were very evenly matched with Queensland the leading crew at the 1000 metre mark with little separating them from Victoria and SA. At the 1500 metre mark nothing again separated the crews. Victoria then made a determined effort to take the lead which they held to the line. Gillian Campbell lead the race for the first 1500 metres but Adair Ferguson made a sustained effort over the last 500 metres to pass not only Campbell but also Kay from Tasmania to win. 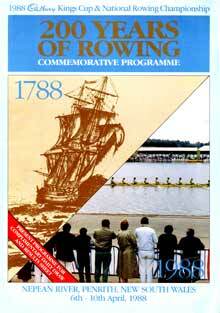 The NSW crew won the race convincingly but were subsequently disqualified for a doping infringement. The finishing margin was 5.05 seconds between NSW and Victoria and 5.94 seconds between Victoria and SA. 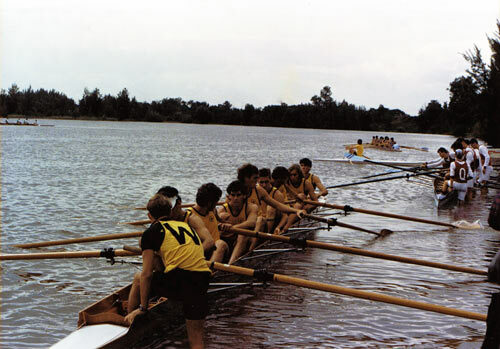 This was the inaugural Women's Youth Championship and a great race between Queensland and Victoria. Queensland led through the half way mark but were passed in the third 500 metres by Victoria. However Victoria could not maintain the pace and Queensland prevailed over the last 500 metres in a great race to win by 1.67 seconds.